Before I do anything else I want to take a minute to say hello to each and every one of you, whether you've followed me from my original blog (Peace, Love, Teen Fiction) or if you've just stumbled upon this new one today. The fact that you took even a second to look at my little blog makes me so happy because it means I might be able to share a book that I loved with you. In terms of blogging I've been silent for a little over four months trying to get this new website up and running, all while juggling school, work, and a vacation. Now that I've finally pulled everything together I hope that I'll be able to bring all of these big ideas I have for this blog to fruition and create an environment where everyone will fell free to interact with me and each other about fantastic (mostly YA) books. In the next few weeks I hope to get up some mini-reviews of the books that I read over my "break" along with some full reviews for the more recent ARCs I've read and all the books I'll be reading from now on. I also plan on having at least one interview up on the blog a month and am in the process of setting up several that I hope you guys will love. It's also my goal to get on top of going to the post office in a timely manner after a giveaway, which I think I'll start right now. 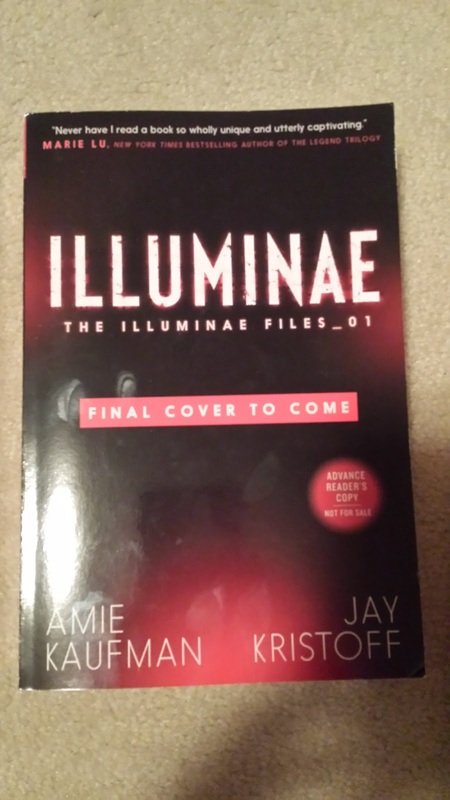 Below you can enter to win either an ARC of Amiee Kaufman and Jay Kristoff's upcoming book ILLUMINAE (which I recently read and is unlike anything out there right now) or a blind date with a book that I will personally pick for you based on your goodreads shelf (or you can give me a genre and titles that you liked). *The giveaway will run from 7/18 to 7/27/2015. The winning entry will be verified. ARC only available to those living in the US and Canada; blind date with a book open internationally. Winner will have 72 hours to respond to an email or the prize will go to another person. I also want to give a shout-out to Asma from Design 9A who created the absolutely fantastic blog layout I'm using. If you need excellent web design work done for affordable prices she's the person to contact! Aww, thank you! <3 I recently read ILLUMINAE and while it was different from THESE BROKEN STARS there were some similarities, so if you liked one I think you'll like the other. It's definitely unlike anything I've ever read before, what with almost no direct prose. It's told almost entirely through IM's, emails, recovered journals, and the like. Ooh I just read Emmy and Oliver. MUCH cuteness! Oh my gosh I read this recently too and I just want to give it big smooshy hugs cause it's so adorable!!! I recently read The Wrath and the Dawn and really enjoyed it! It's a bit slow in the beginning, but it has a great writing style. Also, I couldn't find where to follow you! Do you have a bloglovin or a way to subscribe with email? I have a google friend connect but let me add a bloglovin and email subscription. :) I actually started The Wrath and the Dawn. I got about halfway through before I decided I couldn't do it anymore cause it just bugged me way to much. I just put up the bloglovin' widget. I have not read this but I've heard good things about it! PS: I agree with Kaylie. Since I don't use GFC anymore since I moved to Wordpress, is there another way to follow your blog?! Thanks! I tried to add a bloglovin button yesterday but it said that they couldn't find my blog, so I added it to the site and they said wait a few hours to search for it, and then I came back today and it's still not there. So grrrr. I am Princess X, I really like it very much. If you haven't read it yet , I recommend it to you. I have heard very good things about this! A Court of Thorns and Roses -- it was fantastic!! Interesting. I've heard of this book but I've not known anyone who has read it. Isla and the Happily Ever After! I would rec Anna and the French Kiss more, though, but since I just recently read Isla thought I'd recommend that one. :) They're super cute! I have read all of these and I agree they are all super cute! I think my favorite was Anna too, with Lola and Isla battling for second! Kiss of Deception by Mary E. Pearson. I'm reading the second book in the series right now, and It's just as amazing as the first. I have heard fantastic things about this series, although I've yet to read it for myself. I liked To All The Boys I've Loved Before by Jenny Han, Red Queen by Victoria Aveyard, and Throne of Glass by Sarah J. Maas. I recently loved Uprooted by Naomi Novik. Top fantasy read of this year for me! :D Thanks so much for the giveaway. This is on my list of books to read for sure, I've heard only good things about it!